While it is always exciting to think about family and friends and go out on the town in search of holiday spirit, it can sometimes feel a little stressful. Selecting gifts for families and friends can be fun but at this point in the holiday shopping frenzy, it can all feel a bit harried. As our lists begin to dwindle, we can sometimes find ourselves scratching our heads when shopping for the last few people on our list. A Boxwood Kissing Ball will liven up any holiday gathering with its bright and traditional colors. Christmas kissing balls are a great alternative to the ubiquitous mistletoe you’ll see this holiday season. Our Boxwood Kissing Ball hits all the marks with the classic Yuletide colors of fresh green boxwood, red berries and bright bow. 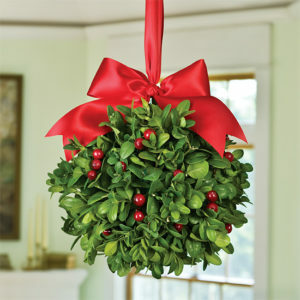 Its full and festive appearance works well over any door and is a breath of fresh air from the typical sprig of mistletoe. Bring it with you to your next holiday party as a fun gift or, if you’re the one hosting this holiday season, hang over a door in your home for a charming conversation piece for guests. 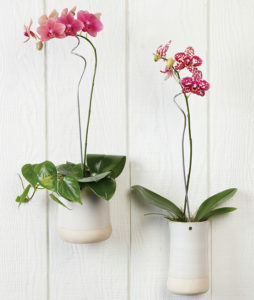 Gift these Hanging Orchids for an interesting alternative to a potted plant. Perfect for a small space or unique wall hanging. Our new Hanging Orchids add an exotic touch anywhere they go. Most of the time, orchids are seen in potted plants that sit but these striking Phalaenopsis orchids arrive in ceramic vases that are designed to hang on a wall. Vertical hanging plants, like vertical gardens, are gaining in popularity as a great way to utilize space and create an interesting alternative to placing a more traditional wall hanging like a painting or a poster. These orchids will freshen up living quarters of all types, from a friend who loves the vacationing in the tropics to a family member whose small space could use a breath of fresh air. For those dreaming of a White Christmas, send a Winter Wonderland Bouquet that celebrates the fluffy, magical snow. While not all of us are fans of winter, snow, and ice, there really is something magical about a white Christmas. For those who are living in warmer climates but miss the white stuff, our Winter Wonderland Bouquet is the perfect gift. 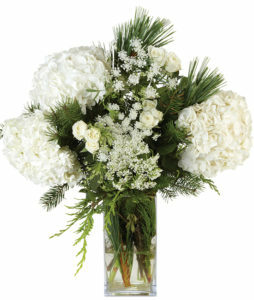 This bouquet features white flowers like fluffy hydrangeas and delicate Queen Anne’s lace and Christmas greens. Even the vase that holds these winter whites is festive, with a ridged texture that is reminiscent of beautiful tracks made in freshly fallen snow. 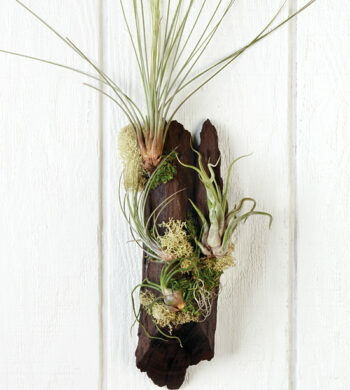 Our Mystical Simplicity Air Plant is a breath of fresh air as a distinctive vertical hanging plant that is incredibly simple to care for with striking results. Know somebody who loves flowers and plants but can be a tad forgetful when it comes to watering? Air plants can come to the rescue as they are easy to care for and look impressive, helping any owner of an air plant to feel accomplished. Our Mystical Simplicity Air Plant is especially stunning. 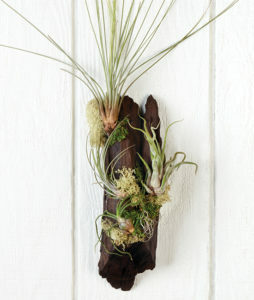 We’ve used several types of air plants in this arrangement to keep things interesting and integrated them into a beautifully rustic wooden board with moss sprout accents, taking the hassle out of finding a planter or structure to display them in. We hope you find the perfect gift among our favorite plants and arrangements that will spread joy over your loved ones this season. No matter what you end up choosing, the message is always more meaningful than the gift itself and we are sure whatever you select will be magnificent.